The County’s South Coast Recycling and Transfer Station is now participating in a new statewide mattress recycling program that allows residents and businesses to drop off mattresses and box springs at no charge (up to five units per day). The program, called Bye Bye Mattress, is operated by the Mattress Recycling Council (MRC) and funded by an $11 fee at the point-of-sale. The fees are used to fund mattress collection, transportation, and recycling services throughout the state, including a fund to help communities battle illegal dumping. 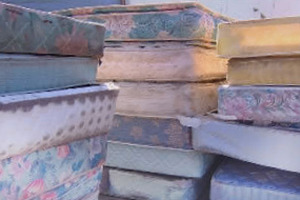 MRC estimates that US consumers discard at least 20 million mattresses and box springs annually. Through recycling, the materials in these products can be used to create new products such as carpet underlay and industrial filters. Head on over to our Mattress Recycling page to find your closest drop-off site. And keep checking back, as more sites may be added in the coming months.